The Doctor of Audiology (Au.D.) at Lamar University offers comprehensive academic, research and clinical experience in a wide variety of settings. The Doctor of Audiology program opened in 2005, replacing the long-standing Master of Audiology degree program. Lamar Audiology has maintained a 2:1 student to faculty ratio per class since its inception. This ratio keeps the size of each class small enough so that students benefit from individualized mentoring from faculty. The Doctor of Audiology program is committed to the advancement of knowledge and services in hearing processes and disorders through integrated programs of professional training, research and community service. Provide the highest quality of hearing health care for the community, including advocacy and support services for the needs of persons with hearing impairment and their families. CareerCast.com, an online career resource for finding targeted job opportunities by industry, function and location, has named “audiologist” as the #2 job on its list of “The Best Jobs of 2015.” According to the U.S. Bureau of Labor Statistics Occupational Outlook Handbook(2014 – 2015), employment of audiologists is projected to grow 34% from 2012 to 2022, much faster than the average for all occupations. Audiologists work on variety of settings including: Private Clinics; Hospitals; Nursing Homes; Public Schools; Special Need schools; Patient homes; and Rehabilitation Centers. Audiologists’ median salary is $69,720, although top 10% of them earn a median salary of $101,130. The following figure (taken from American Speech-Language and Hearing Association) shows the spread of audiologists’ workplace. The Doctor of Audiology at Lamar University is accredited by the Council on Academic Accreditation in Audiology and Speech-Language Pathology (CAA) of the American Speech-Language-Hearing Association, 2200 Research Boulevard #310, Rockville, Maryland 20850, 800-498-2071 or 301-296-5700. See more at: www.asha.org. Use this form to submit a complaint regarding our doctoral program in audiology. All applicants must have a Bachelor’s degree in communication disorders or related field from a regionally accredited institution. Students are expected to have obtained a broad general education as a background to graduate study. Undergraduate course work in mathematics and basic and applied sciences is strongly encouraged. If the baccalaureate degree is not in communication sciences and disorders, courses in the following content areas, or equivalents, may be required for admission: Overview of Communication Disorders, Language Science/Development, Research Methods, Speech and Hearing Sciences, Phonetics/Phonological Development, Audiology (introductory level). Specific undergraduate course requirements are determined on an individual basis. Students with baccalaureate degrees in other areas who wish to apply are urged to contact the program director as early as possible. Students should have 3.0 GPA in their Bachelor’s degree. Graduate Record Examination (GRE) with scores over 280. Letter of Intent signifying your career goals, your major area of study during your doctoral program and your research interests. Three letters of recommendation. The majority of the letters should be from individuals who know your ability in an academic or research forum. We suggest your recommenders write a letter on your behalf in addition to completing the form. 1. Go to www.applyTexas.org and complete an application. This application includes your biographical, education, and residency information. Please contact Dr. Ashley Dockens at audiology@lamar.edu regarding a waiver for the application cost. 2. The following website: https://csdcas.liaisoncas.com/applicant-ux/#/login will lead you through the application process that allows you to submit your transcript, GRE scores, letters of recommendation, and letter of intent. This application portal opens Aug. 2 and closes Feb. 1 for the annual fall cohort. In order to earn a Doctorate in Audiology (AuD), the student must complete both theoretical and clinical aspects of the course and acquire minimum of 99 credit hours. Academic coursework occurs in the first three years of the AuD Program. Students are required to complete a preliminary written exam at the completion of their first academic year and every year thereafter through the third academic year. Students may choose to complete a clinical research project in addition to the clinical coursework progression. Clinical experiences begin in the first semester of the program. First year students are placed in the university clinic for 1 to 2 days per week. Second year students are placed 2 days per week offsite and third year students are placed 3 days per week at off campus sites. After completion of the academic portion of the program, students will complete an externship year of clinical placement in their fourth year of the program. Placement for this clinical experience is made in conjunction with the clinical coordinator and program director for audiology. Considerations for the fourth-year externship include student's clinical area of interest and clinical experience needs outlined in the student's clinical plan of study. This placement typically takes place outside of the Beaumont community. Requirements for the academic and clinical portions of the program will be reviewed annually with students during academic and clinical plan of study meetings. The following table provide details about the curriculum and the courses offered in different stages of the AuD program. A variety of practical opportunities are available at the Speech and Hearing Center on campus and currently in 23 off-campus sites throughout Beaumont, Houston, San Antonio, Lake Charles, Shreveport and Biloxi. These outstanding off-campus clinical sites include hospitals, schools and private practice settings. Hearing Evaluation: Diagnostic testing includes pure-tone and speech audiometry, acoustic immittance measures and pediatric testing with VRA. Hearing Aid Clinic: The clinic focuses on the selection, verification and orientation of amplification and assistive listening devices to increase the communication function of each individual. Deaf Co-Op: Conducted in public school settings, which allow the students to learn hearing aid troubleshooting as well as assistive listening device selection and maintenance. Electrophysiology Clinic: Diagnostic testing using OAE, ABR and SSEP are used in the differential evaluation of hearing disorders. Vestibular/Balance Clinic: Assessment includes VENG, EENG and vestibular rehabilitation therapy. Industrial Hearing Conservation: This clinic includes monitoring hearing in the industrial setting and providing sound measurement and hearing conservation services. Auditory Processing Disorder (APD) Clinic: This clinic provides full diagnostic evaluation of auditory processing problems along with counseling of family members and school personnel. Aural Rehabilitation: Group and individual therapy is provided to enhance listening, speech reading and communication abilities. All AuD students (including international students) are eligible for out of state tuition waiver from graduate school. All year 1 AuD students are eligible for graduate assistantship (work 1-2 days per week) for which they may receive an assistantship stipend of $6,000. This stipend will also make them eligible for a tuition reimbursement for the entire academic year. There are opportunities for graduate assistantships during year 2 and 3. To learn more about financial aid, visit LU's student financial assistance website. Audiology faculty are involved in variety of lab and field-based research in hearing sciences. AuD students have the opportunity to participate in some of these research studies as graduate assistants. In addition, students can also consider doing the capstone project. Please refer to faculty profiles to find out more about research interest and the specific research studies they are involved. 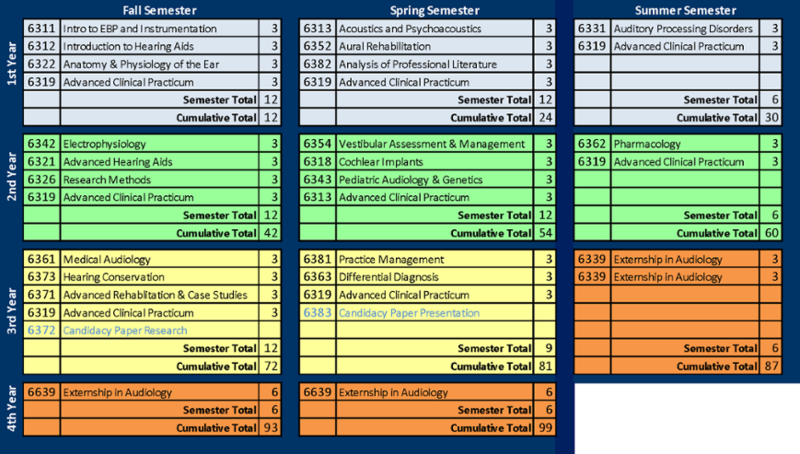 NOTE: Number and percentages reflect the audiology graduates employed in the profession or pursuing further education in the profession within one year of graduation. Use this form to submit a complaint regarding our doctor of audiology program.